Hey Salesforce Developers! We know you’ve probably already picking up a ton of badges, but there’s always more learning to unlock! That’s why we’re inviting you to join us on a 10-day learning adventure where you’ll build a business app from start to finish. Interested? Whether you’re an experienced developer or just starting out with code, anyone can Be a Builder. Starting today, every morning at 10 a.m. PDT, you can watch a new video covering the “Topic of the Day” in the app building process and check out a demo of an app in-progress. You’ll learn new skills and insights with our Salesforce Developer and Admin Evangelists. You’ll also have the chance to earn Trailhead badges by completing the recommended module each day. We just published a bunch of recordings from TDX18 and think these sessions will amplify your Be a Builder journey. Build Apps with Salesforce DX: Gain insights on how three different companies are using Salesforce DX to build apps. Building Lightning Fast Apps with Platform Cache: Make your apps faster and optimal with Platform Cache. You can specify what to cache and for how long. Create Dynamic Experiences with Lightning App Builder: Build great apps without using code. Deliver, Manage and Scale Apps: A Tour of Heroku: With the Heroku developer experience, you can build, deploy, and manage apps and set up a team-based continuous delivery pipeline. 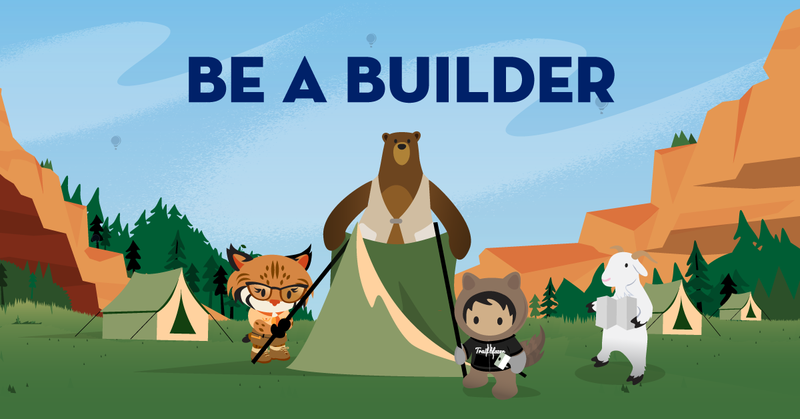 These videos from TDX18, along with the Be a Builder videos and Trailhead modules, will help you create amazing apps. Enjoy the journey, and happy app building!